Today, I visited the Melbourne Zoo and one of the cool animals that I saw was the Indian star tortoise. These beautiful tortoises grow up to 35 cm long. The females are larger than the males. They mainly eat grass, fruit, flowers and leaves. At breeding time, female Indian star tortoises lay 4-8 eggs in a shallow hole in the dirt. These eggs take about 3-4 months to hatch. Their shell is very beautiful, but also very practical. They provide excellent camouflage and when they are tipped over onto their back, they are able to easily get back onto their feet. 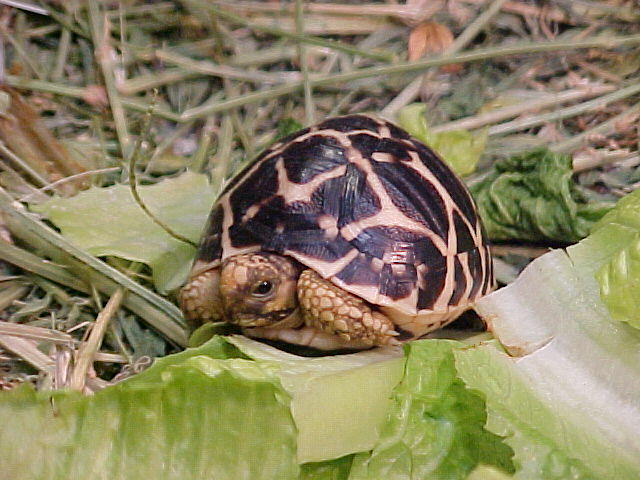 Indian star tortoises are found in very dry, harsh areas of India, Pakistan and Sri Lanka. They are often taken from the wild for the pet trade, but are not in danger of extinction. Are there any other interesting facts that you would like to share about Indian star tortoise?